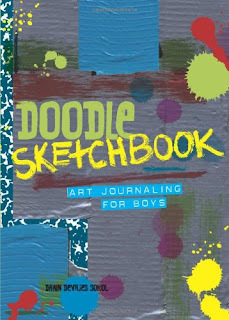 Much more than a basic sketchbook!! Suggestions for decorating the pages with collages, photos, clipart, rubber stamping, and a wide variety of mediums to make the book your own. Thicker pages allow for attaching other paper and designs right to the book. Geared for boys to let their imagination run wild. Decorate an ipod drawing, learn urban alphabets, doodle a sci fi world, draw creatures, design with stickers and more. Original in the journaling prompts and designs. Boys are going to love this small book they can throw in their back pack. Great gift giving idea for any boy ages 8 and up. I received a copy of this book from Gibbs-Smith in an exchange for an honest review.